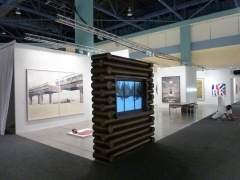 Sean Kelly Gallery is pleased to announce that we will be exhibiting at Art Basel Miami Beach (Booth E25). 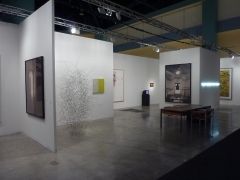 Our booth will include a diverse and impressive group of new works including photographic works by James Casebere, Robert Mapplethorpe and Frank Thiel; sculptures and installations by Leandro Erlich, Los Carpinteros, Iran do Espírito Santo, Joseph Kosuth and Wolfgang Laib; and paintings and works on paper by Rebecca Horn, Callum Innes, Anthony McCall, Julião Sarmento and Gavin Turk. For the first time at Art Basel Miami, we will show works by Laurent Grasso, a French born artist, who has just joined the gallery. A recipient of the 2008 Marcel Duchamp Prize, Grasso is known for making work that blurs the lines between belief and reality (present, past and future), memory and perception, technology and natural phenomenon. To mark Marina Abramovic's forthcoming retrospective at the Museum of Modern Art from March 14 until May 31, 2010, we will present her latest work, a large photographic work entitled The Kitchen I - Homage to Saint Therese. To celebrate Antony Gormley's upcoming major outdoor public installation entitled Event Horizon - which will be on view in New York in and around Madison Square Park from March 23 until August 25, 2010 - we will show a magnificent sculpture entitled Quantum Void III. 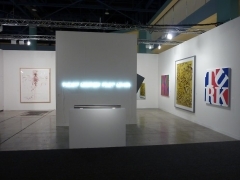 The fair will be held at the Miami Beach Convention Center and will run from noon to 8:00 p.m. on Thursday, December 3 through Saturday, December 5, 2009, and on Sunday, December 6, 2009 from noon to 6:00 p.m. Please come visit us at Booth E25.